Coimbatore- "The Textile Capital Of South India" Or " The Manchester Of The South"
"The Textile Capital of South India" or "The Manchester of the South", the city is situated on the banks of the river Noyyal. Located in the shadow of the Western Ghats, Coimbatore enjoys a very pleasant climate the year round, aided by the fresh breeze that flows in through the 25-km long Palakkad gap. The rich black soil of the region has contributed to Coimbatore's flourishing agriculture industry and, it is in fact that the successful growth of cotton that served as a foundation for the establishment of its famous textile industry. The first textile mills came up as far back as 1888 but there are now over a hundred mills. The result has been a strong economy and a reputation as one of the greatest industrial cities in South India. 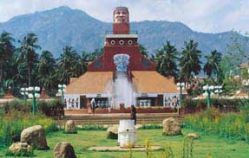 Coimbatore serves as an entry and exit point to neighbouring Kerala and the ever-popular hill station of Udagamandalam (Ooty). It is the disembarking point for those who want to take the Mountain train that runs from Mettupalayam, just 35 km from Coimbatore. Anamalai wildlife sanctuary is about 90-km from Coimbatore and is situated at an altitude of 1,400 meters in the Western Ghats near Pollachi. The area of the sanctuary is 958-sq-kms. An ecological paradise, this sanctuary encompasses a National Park. It has just recently been renamed Indira Gandhi wildlife sanctuary. Black Thunder, a water sports and amusement park is situated about 40-km from Coimbatore on the Ooty main Road. When you need time off from the rest of the world, time to be with your family, time to share moments of adventure and fun with friends, time for children to experience fun and joy, time to take a break- Black Thunder is your destination. Parambikulam-Aliyar Multipurpose Project project consists of a series of dams interconnected by tunnels and canals for harnessing waters of the Parambikulam, Aliyar, Nirar, Sholiyar, Thunakadavu, Thekkadi and Palar rivers, lying at various elevations, for irrigation and power generation. The scheme is an outstanding example of engineering skill. It is located in the Anamalai range. Named after the freedom fighter V.O.Chidambaram, the VOC Park is the most appropriate place to go with children. The Coimbatore Corporation maintains the park. The Park houses a mini Zoo, models of prehistoric dinosaurs, Children' Train, Swing, Slider, Seesaw and other play equipment and is more like an amusement park for the children. The park has a stretch of grass patch conveniently mowed to sit on. An important textile centre in Coimbatore district, it is also famous for hosiery products. Thiruppur is also closely associated with ' Thiruppur Kumaran ' one of the valiant freedom fighters. It is 50-km from Coimbatore. The Forest College is one of the oldest of its kind in the country. 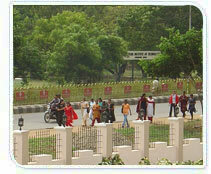 The Forest College is situated 3.5 km north of the railway station of Coimbatore. The college museum is worth a visit. The museum preserves the fossils of plants and animals. The museum also has dead specimen of plants and animals of rare variety. The museum also has a special advisory counter offering service to promote businesses related to plant husbandry. The Government set the Khadi Gandhi gallery up in Coimbatore on 15th of July 1970. The gallery displays pictures of Gandhi right from his birth to his death. Separate cubicles are arranged for each phase in Gandhi' life, which pictures all major events that occurred in his life. There are interesting collections of rare photographs titled 'Journey through Harijan Life', 'Family', 'Friends', 'Independence Struggle', 'Jail Life' and "Peace Talks'. Gandhi Jayanti is celebrated with grandeur in this gallery and the collector visits the gallery during 'Gandhi Jayanti' and participates in the function followed by bhajans. The government initiated the museum in 1989. The museum is situated in VOC Park Road, which bears the remnants of various tribes of the place. The museum is compartmentalized into 5 sections. The museum bears fossil remains and age-old tools. The megalithic burial materials, treasure trove materials, ancient coins and decorative artifacts are few among the rare items that are displayed. There is a separate section for old rocks, minerals and wood fossils and tribal medicinal plants. About 12-km away from Coimbatore railway station is the Marudhamalai temple of Lord Muruga. The temple is situated on the Marudamalai (Maruda is the colloquial form of Marunthu, which means medicine and Malai means mountain) mountain and is one of the most visited temples in the region, the reason being that the presiding deity, known as "Dandayuthapani" is believed to have performed several miracles here. Perur Patteeswaraswamy temple built by Karikala Cholan is located 7-km west of Coimbatore near river Noyyal. Coimbatore has many temples out of which the Perur Patteeswara Swamy temple is the most popular one. The temple upholds huge statues. The significance of Perur temple in earlier days is unfolded in the poetic creations of Arunagiri Nather and Kachiappa Munivar. Thirumoorthy Temple is situated at the foot of Thirumoorthy Hills adjoining the Thirumoorthy Dam. This is about 20 km from Udumalpet on the Highway from Palani to Coimbatore. A perennial stream flows by the side of the Sri Amalingeswarar temple and nearby there is a waterfall. The Crocodile Farm at Amaravati Dam is just 25-km from here. This place is being developed as a District Excursion Centre. Regular buses are available from Udumalpet. Sengupathi Water Falls are situated 35-km from Coimbatore on the Coimbatore - Siruvani main Road. 65-km from Coimbatore and 27-km from Pollachi on Coimbatore-Pollachi-Valparai Highways are the Monkey Falls, a famous picnic spot. The Siruvani waterfalls and the dam are located at a distance of 37-km west of Coimbatore. The water of Siruvani is known for its minerals and taste. The panoramic view of the dam and the falls are of enchanting beauty. Located 30-km from Coimbatore via. Narasipuram village are the Vaideki Falls. It is a fine picnic spot for trekkers. 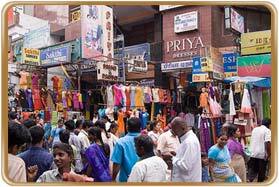 Being a major city of the state, Coimbatore offers various accommodation options for tourists. There are star hotels, moderate class and small budgeted hotels and lodges. Accommodation is also available at the Railway Retiring Room, Railway Station Corporation; Bus Stand Rest House, Central Bus Stand; and Sports Development Authority Dormitory. Peelamedu airport is 10-km from the city, which operates regular flights to Bangalore, Mumbai, Chennai, Kochi and Madurai. Coimbatore is a major railway junction on the Southern Railways and has trains to Chennai, Rameswaram, Madurai, Bangalore, Mumbai, Kanyakumari, Kozhikode, Mettupalayam, Kochi and Delhi. Tourist Information Counter Government of Tamil Nadu, Railway Junction, Coimbatore.